It can be a bit tricky to determine the nature of a mystery metal, and in the home workshop it can be even harder to tell the purity of a metal. So I looked up the density of Aluminium and it’s 2700kg/m³ or 2.700g/cm³. If the metal density is close to this number then I can confirm that it is Aluminium and does not have many impurities. 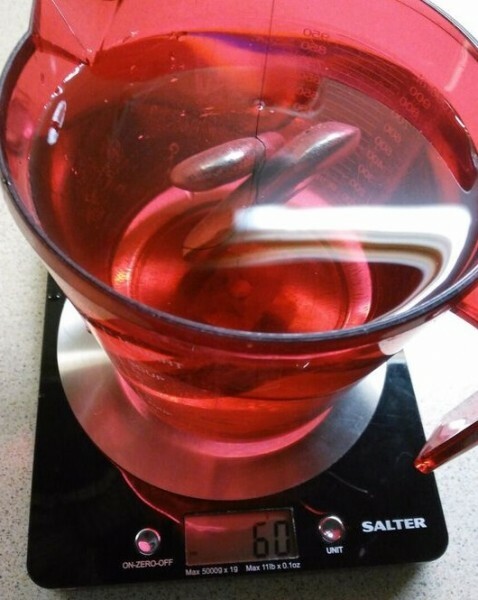 Measuring the mass is straight forward with a digital kitchen scale, I placed on all my ingots as that should give a more accurate result than working with smaller quantities. The volume was trickier, I knew I could use an Archimedean principle of water displaced but I did not have a way of accurately measuring the volume of water. However I could weight the mass of the water and as water has a useful property of a density of 1g/cm³ then the volume could be easily determined. My experimental rig was 2 different sized containers, some digital scales and some water. I sat the larger one on the scales and zeroed the readout. Then the smaller container was placed inside and carefully filled with water. I filled the water right to the brim so that it was almost overflowing. The ingots were then carefully placed into the water and it overflowed into the outer container. The first time I did this I tried to move the inner container, spilling water into the outer container. 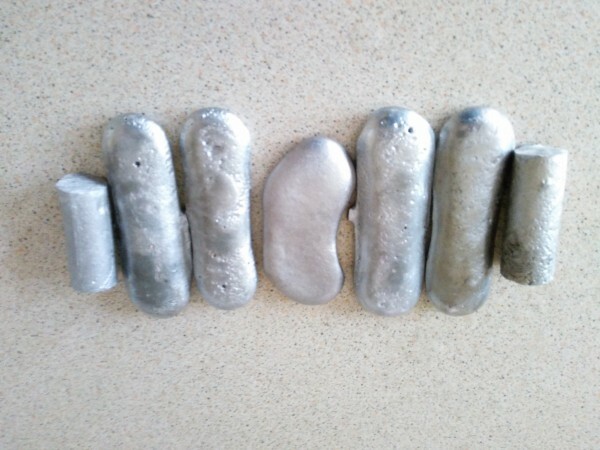 So the second attempt I used some tongs to remove the ingots (tongs have a smaller volume than fingers) and that reduced the inner water level sufficiently to move it without spillage. I was then left with the outer container containing water that had the same volume as the metal. The mass of the water could be read from the scales readout. My results were as follows. If I was being scientific about things I would repeat this a few times to ensure consistent results. I’d be interested to hear alternative methods that could be done at home that might improve the accuracy. I followed Damien’s advice (see the comments below) and weighed the ingots in air and in water. As Damien mentioned, the water provides some support for the metal in the form of buoyancy. If that’s less than the downwards force due to gravity, the item sinks. Archimedes principle: “The buoyant force exerted on a body immersed in a fluid is equal to the weight of the fluid the body displaces”. As it’s a static system the bouyancy force needs to be balanced by a downwards force of equal value which we can measure on the scale. So the new method is much simpler. The metal is weighed on the scales. 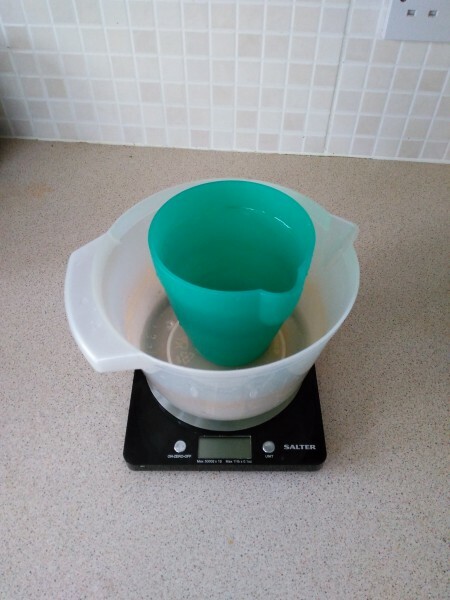 A jug of water is placed on the scales and the scales zeroed. Then the metal is suspended in the water, making sure it is under the surface and not touching the bottom. As the method has less chance for error (or splashing) then the number is likely to be more accurate. The difference from 2.7 could be due to air bubbles or impurities in the metal. 0.067 difference (the other way) so still about 2% so the conclusion still stands, it’s aluminium but perhaps with bubbles or impurities. Ref: Source: Boundless. “Flotation.” Boundless Physics. It worked but I think it is a classic confusion to want to measure the water volume when using Archimedes. Suspending the metal in water (without touching the bottom) and then measuring the increase in weight gives the equivalent water volume. Damien, how does that work? The metal will displace water and that water displacement will add up to the weight. Or said differently: Even if it tends to sink there is a partial buoyancy that weights on the scale. A lighter floating object behaves differently, it would add up its weight through water displacement but would not give its volume unless forcefully submerged. Thanks Damien, my high school physics is a bit rusty. Hanging the ingots on a thin piece of thread should work nicely and get more accurate results for volume. I’ll see if I can give that a try.